MUMM-RA, The Ever-Living, with MA-MUTT guarding the pyramid, visits SKYTOMB and convinces the LUNA-TAKS to use their slaves as bait to trap the ThunderCats. 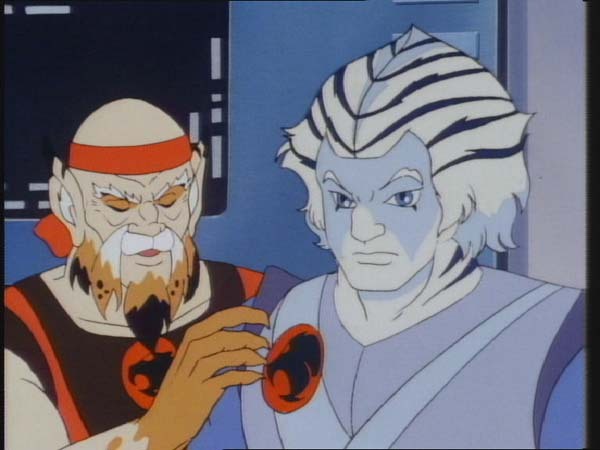 The ThunderCats, believing they cannot attack the LUNA-TAKS until they rescue SKYTOMB’s slaves, go to DARKSIDE. 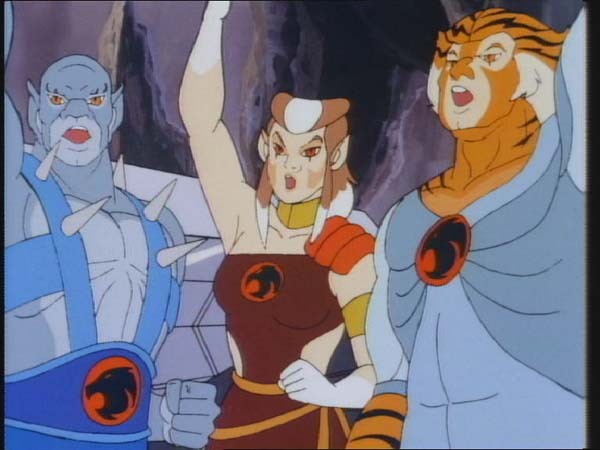 At DARKSIDE, the LUNA-TAKS attack the ThunderCats: RED-EYE captures TYGRA; ALLURO captures PANTHRO; and CHILLA captures PUMYRA. Meanwhile, LYNX-O and CHEETARA go to MUMM-RA’s pyramid to determine if MUMM-RA is alive. There they find a strange TALISMAN but do not find MUMM-RA. 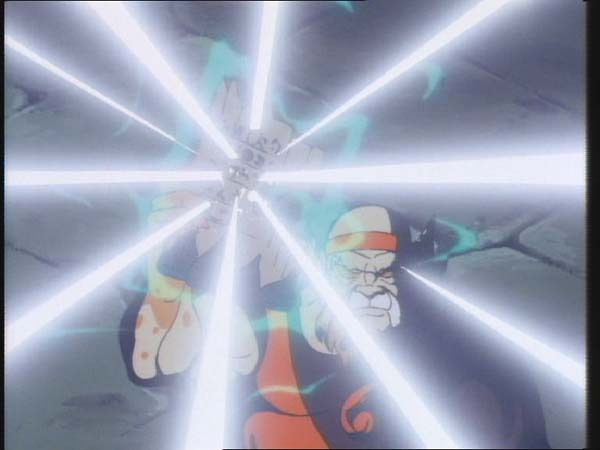 They are attacked by MA-MUTT, but LYNX-0 uses the TALISMAN against MA-MUTT and discovers it possesses a magical power. MA-MUTT retreats and LYNX-O and CHEETARA are thrown from the pyramid in an explosion of white light. The Sword of Omens alerts LION-O to the ThunderCats’ capture and as LION-O summons the other ThunderCats, he is distracted by LUNA’s cry for help. No sooner does LION-O come to LUNA’s aid that he is ambushed by AMOK and captured. The LUNA-TAKS steal the Sword of Omens from LION-O. 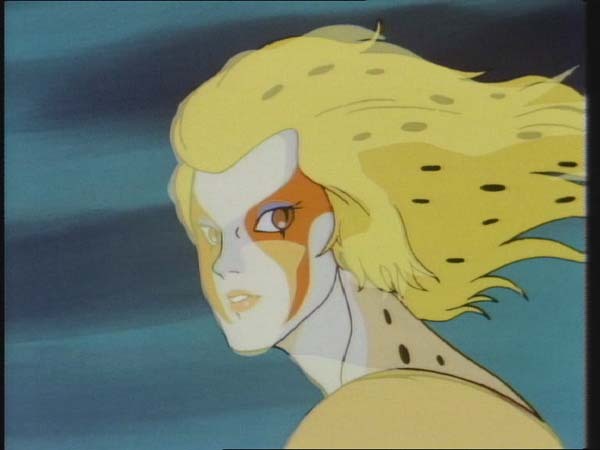 CHEETARA’s sixth sense alerts her to LION-O’s predicament, and she and LYNX-O go to his aid. 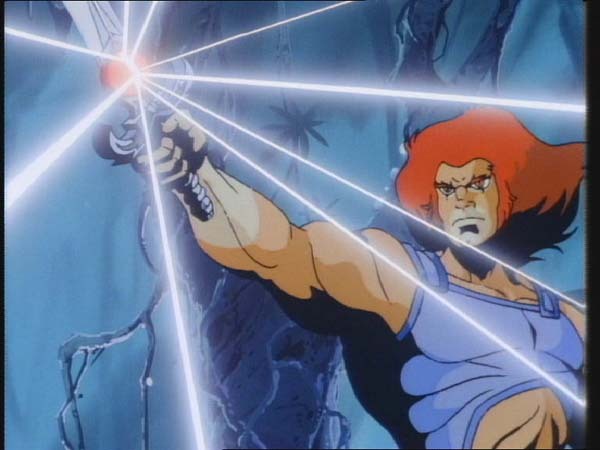 LION-O succeeds in calling the Sword to his hand, using the ThundeeCats signal, giving the captured ThunderCats the power to free themselves. Once free, LION-O holds his claw shield up to MUMM-RA showing him his hideous reflection, but soon learns that this no longer defeats MUMM-RA. 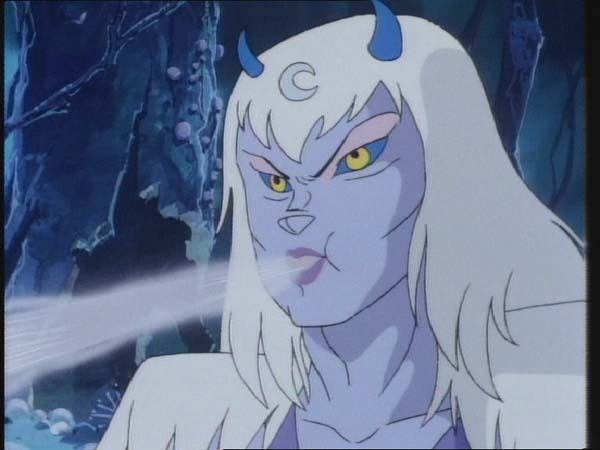 LYNX-0 and CHEETARA use the magic TALISMAN against MUMM-RA who recoils from its brilliant light and is forced to fly off. The LUNA-TAKS, awed by the TALISMAN’s, power, fight amongst themselves to posses it, as LYNX-0 throws it into their midst. The ThurderCats leave SKYTOMB and the squabbling LUNA-TAKS. The ThunderCats’ ability to work as a team contrasts with Mumm-Ra and the Luna-Taks’ inability. As a group the ThunderCats are able to work together successfully, because they value life in common and base it on shared moral principles like justice, truth, honor, and loyalty. When faced with danger, they develop a communal plan of action, Sharing responsibilities and assignments made on the basis of their individual talents. In contrast, Mum-Ra and the Luna-Taks do not share a positive moral code or believe in community. They sock destruction and favor individual gain at the expense of others. As o result, their teamwork is exposed as temporary and ineffective. It is no match for the strong communal effort of the ThunderCats. Effective teamwork is based on a willingness to share our individual efforts for a common goal. Often in our lives we are involved in working together with family or friends on a project. When each member of the team values the goal and appreciates the bonds shared in common with others, it makes it fun to work together. And when we acknowledge and value what we share, it makes it more likely we will succeed in our task. The last chapter in any well written story induces feelings of bittersweetness for the audience. The joy of reaching the destination is mixed with the sadness of having arrived at the end of an enjoyable journey. The final act is also crucial for the writers as it is their chance to deliver an impactful conclusion. It’s also a chance to transcend any earlier flaws in their tale. The fifth and final episode in the “Mumm-Ra Lives!” story arc begins with Mumm-Ra, now fully rejuvenated, doing what he does best, planning to destroy the ThunderCats. He flies off to Skytomb to enlist the help of the Lunataks. 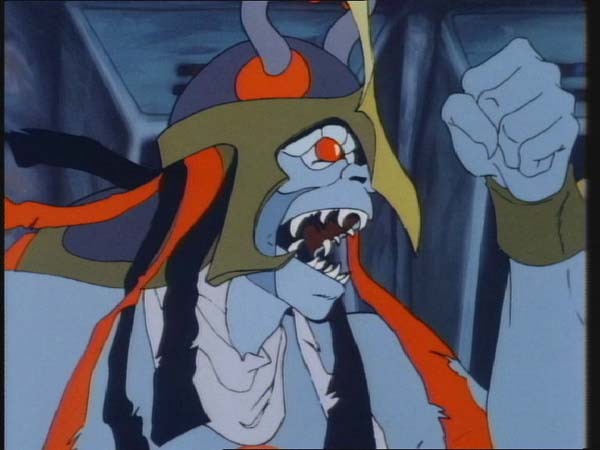 Mumm-Ra convinces the Lunataks to use the Brutemen, Wollo, and Bolkin slaves as bait to lure the ThunderCats to them. Meanwhile in the Tower of Omens, the ThunderCats are planning the exact rescue of the slaves that Mumm-Ra is hoping for. 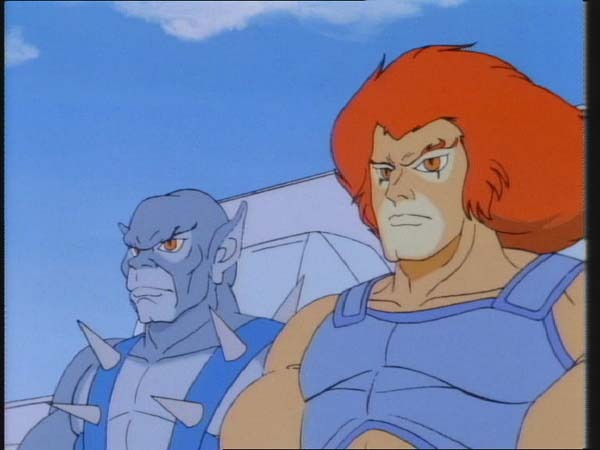 The ThunderCats are not yet sure if Mumm-Ra is alive or not, and so Lynx-O and Cheetara set off on a recon mission to the Black Pyramid while the rest of the team heads to Skytomb. From here on, instead of thrilling the audience with an exciting rescue operation and an action-packed clash between the heroes and the villains, writer Leonard Starr chooses a very insipid narrative to conclude the episode. Lion-O, Tygra, Panthro and Pumyra are effortlessly captured by the Lunataks while Lynx-O and Cheetara miraculously escape from the Black Pyramid thanks to a mysterious talisman that they find there. 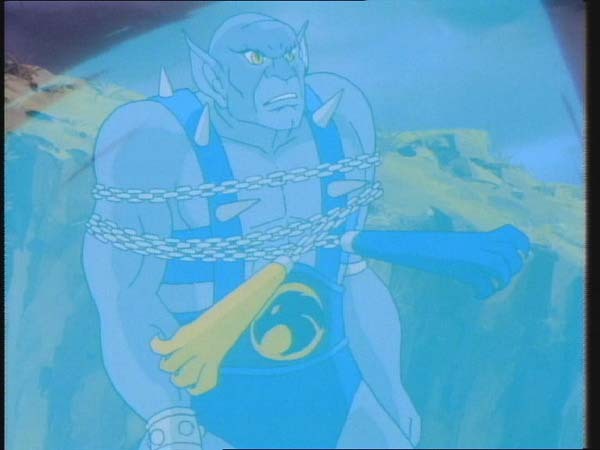 Lynx-O then uses the same talisman to overpower Mumm-Ra and to distract the Lunataks while the ThunderCats escape from Skytomb. The introduction of the “miracle talisman” is nothing more than a lazy plot device employed for an easy resolution. 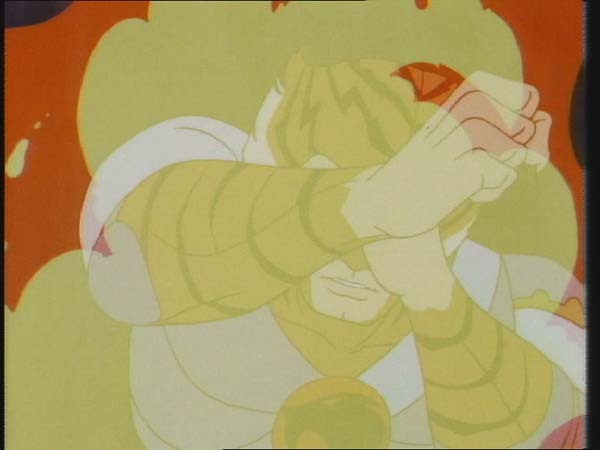 Starr does try to sprinkle some novelty into the story by making the resurrected Mumm-Ra immune to his reflection, putting an end to the cliché method that Lion-O has utilized to defeat him in countless episode. However this minor plot twist is not enough to stop the episode from spiraling. 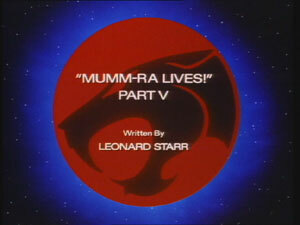 Looking back, all five of the “Mumm-Ra Lives!” episodes are Starr’s weakest contributions to the ThunderCats series. 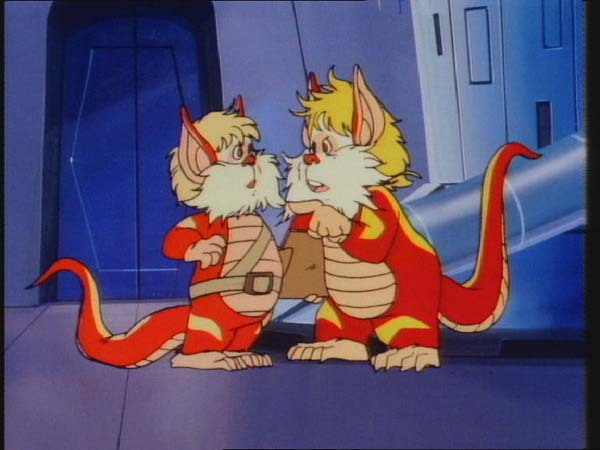 Unlike the previous five-parter “ThunderCats Ho!” which featured numerous characters all getting substantial screentime, this pentalogy hinges on a very limited cast. The five chapters’ purpose ends up being to introduce the Lunataks to the audience and also familiarize them with the skills of the new ThunderCats recruits. Because of this, the episodes are just a collection of skirmishes between the ThunderCats and the Lunataks, and other characters like the Mutants are relegated to bit parts. But perhaps the most disappointing demotion is that of the titular villain Mumm-Ra, whose role is nothing more than a cameo. In conclusion, the “Mumm-Ra Lives!” quintet is a story of failures. 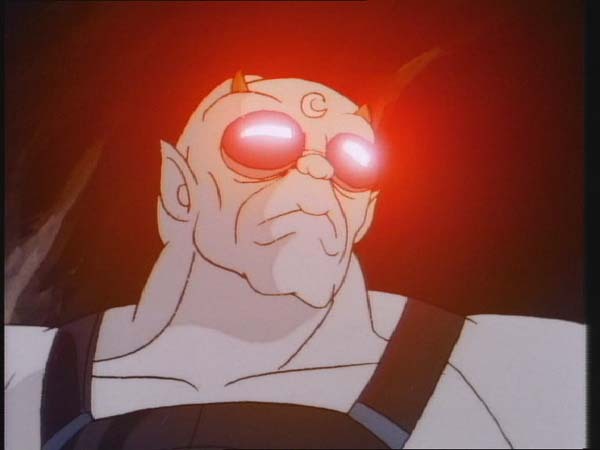 Failure of Mumm-Ra to show off his newly acquired powers, failure of the Lunataks to defeat the ThunderCats, failure of the ThunderCats to rescue the slaves of Skytomb and sadly, it denies Leonard Starr the chance to end his praiseworthy stint on ThunderCats on a high note. Bengali being told to remain behind at the Tower of Omens and his apparent dismay at missing the action is an echo of the same circumstances experienced by the ThunderKittens in numerous episodes. Amok captures Lion-O when he goes to help Luna, who pretends to call for help. Lion-O’s line: “Who are you?” indicates that he does not recognize Luna. This is rather curious as he had seen her in the previous episode and Luna’s is not a face that one forgets easily! As Luna and Amok carry the unconscious Lion-O to Skytomb, a close-up shot of the Sword of Omens reveals that the entire bottom part of the sword is erroneously colored red.